Space exploration was unthinkable for anyone except the US and USSR in the early 1960s. Today, students and startups can launch satellites. 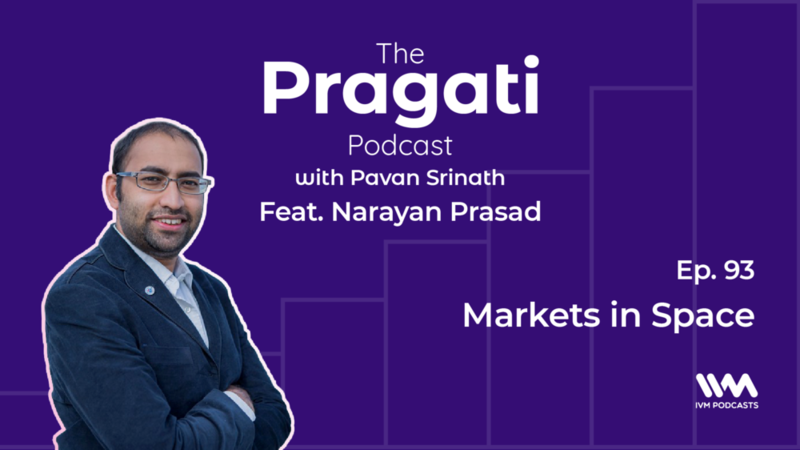 Narayan Prasad joins us on this episode of The Pragati Podcast to tell us about this amazing transformation of human activities in space. The Pragati Podcast is a weekly show on public policy, economics and international relations hosted by Pavan Srinath. Narayan Prasad joins us to share how the space economy has evolved over the last sixty years, and what's happening in India. Narayan Prasad is a co-founder at Satsearch, a global marketplace for space which is incubated by the European Space Agency. He is also an Associate Research Fellow at the European Space Policy Institute, and he helped start New Space India, where a growing group of space enthusiasts and professionals are coming together to form a community in India. Subscribe & listen to The Pragati Podcast on iTunes, Saavn, Spotify, Castbox, Google Podcasts, AudioBoom, YouTube or any other podcast app. We are there everywhere. The Pragati Podcast is a weekly talkshow on public policy, economics and international relations hosted by Pavan Srinath. Amit Varma hosts The Seen and the Unseen podcast and was at the helm of Pragati for the last two years. Do astronauts grow up dreaming of going to space? What makes human spaceflight special? Listen to astronaut and former head of NASA Charlie Bolden on Episode 91 of the Pragati Podcast. Major General Charles Frank Bolden Jr. grew up in South Carolina during the era of segregation, and went on to become a US Marine, a pilot and then a NASA astronaut. Clocking over 680 hours in orbit around the earth, Gen Bolden piloted two Space Shuttle Missions and commanded two more between 1986 and 1994. After retiring from his military career, he was called back by Barack Obama to serve as the NASA Administrator for 8 years. He is currently the US State Department Envoy for Space, and visited Bangalore in this capacity. He is on twitter at @cboldenjr. This short episode was made possible thanks to Provoke Lifestyle, South India's Premier Lifestyle & Social Magazine and its Editor-in-Chief Rōmal Lāisram, as well as the US Consulate in Chennai. We hear about the all-powerful District Collector or Deputy Commissioner in every district in India, but what do they really do? How was the Government of India's first successful health insurance scheme launched? What is the relationship between civil servants and politicians? Anil Swarup talks about his stellar career as an IAS Officer on Episode 90 of The Pragati Podcast. Mr. Anil Swarup is a former Secretary, Government of India, a retired IAS officer and the author of Not Just a Civil Servant, where he chronicles his 38 years working for Governments of India and Uttar Pradesh. In his career, Mr. Swarup has handled India's Coal auctions in the aftermath of the Coal Scam. He has served as Secretary, School Education, and while working in the Labour Ministry, helped conceive and launch the Rashtriya Swasthya Bima Yojana, a government-funded health insurance scheme for poor workers and their families. Great science needs great journalism, and that's in short supply in India. 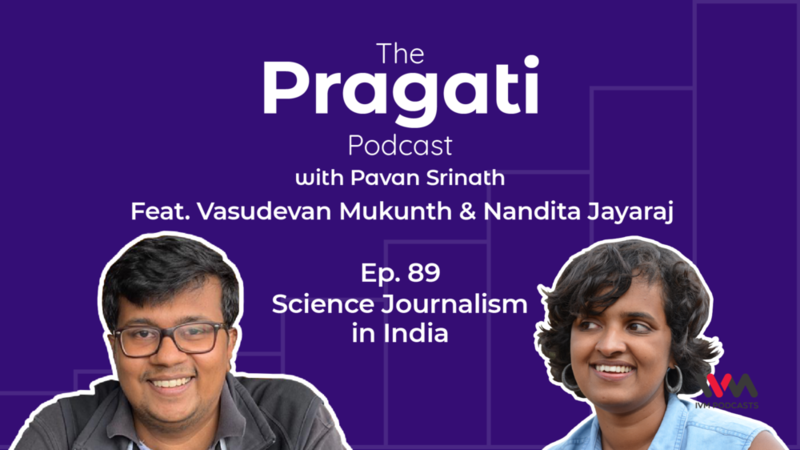 Nandita Jayaraj and Vasudevan Mukunth talk about science journalism on Episode 89 of The Pragati Podcast. The Pragati Podcast is a weekly talkshow on public policy, economics and international relations, hosted by Pavan Srinath. Nandita Jayaraj is the co-founder of www.thelifeofscience.com, an independent collective and a media platform focusing on women scientists in India. This includes articles, interviews and a podcast. Vasudevan Mukunth is the Science Editor for The Wire, who built the science section of The Wire from the ground up. Kannada barutta? Check out The Thale-Harate Kannada Podcast co-hosted by Pavan Srinath, with fantastic conversations on Bangalore, Karnataka and the world every Wednesday. As we enter 2019, Indians have close to 1.2 billion phone connections, and close to half a billion smartphones with 3G and 4G connections. India got here by leap-frogging over wired telephones to cellphones, and over computers directly to smartphones. Rahul Matthan returns to the Pragati Podcast to talk about what made India's telecom revolution happen. In this episode, Rahul and Pavan discuss how India liberalised its telecom policies step by step, allowing the sector to grow, allowing competition to thrive, and enabling millions and now close to a billion Indians to get access to cellphones and get connected with the rest of India and the world. They also discuss what policy imperatives drive telecom regulations, TRAI as a regulator, and what India's policy challenges are beyond 2019. Rahul Matthan is lawyer and Partner at Trilegal who has specialised in technology, media and telecom law in India. He has been a regular guest on the Pragati Podcast, previously appearing on Episodes 53, 54 and 64 among others, to talk about the the evolution of privacy in India and the world, and helped us unpack the Supreme Court's judgments on Aadhaar in 2018. Rahul is the author of Privacy 1.0 to 3.0: Unlocking our Data-Driven Future. Rahul has also contributed a chapter on telecom regulation in an upcoming book: Regulation in India: Design, Capacity, Performance edited by Devesh Kapur and Madhav Khosla. How did E-Commerce grow from next to nothing in India a decade ago to a $50 Billion industry today? Is Indian e-commerce business little more than a clone of e-commerce in the United States or elsewhere? Akshay Alladi talks about the business and the public policy challenges of e-commerce on Episode 87 of The Pragati Podcast. Akshay Alladi chronicles the rise of e-commerce and online retail in India, shares India-specific innovations that took place, and what caused various inflection points in its growth. He talks about various aspects of the business, and also about how foreign direct investment, taxation policies and more affect online retail. The episode also includes a discussion on the most recent 'clarification' issued by the Government of India on FDI in e-commerce, and how it can profoundly reshape the sector for the worse. Akshay has worked at key roles at Flipkart and Ola, with a career in management consulting before that. Akshay is currently working in venture capital in Bangalore. The Pragati Podcast is now on Instagram! Follow at https://instagram.com/pragatipod. If you have any questions, comments or suggestions, do write in to podcast@thinkpragati.com. 2019 is an important year for Afghanistan, with national elections scheduled for July. At the same time, the people and the State of Afghanistan continues to face grave threats to their national security, and the Taliban continue to remain relevant. Afghanistan regained a lost spotlight in 2001 with the 9/11 attacks and the US War on Terror, but what was Afghanistan like in the 1980s and 90s? Who were the Taliban and how did they rise to power? How did India remain engaged with Afghanistan's legitimate government and the Northern Alliance when most of the world looked away? 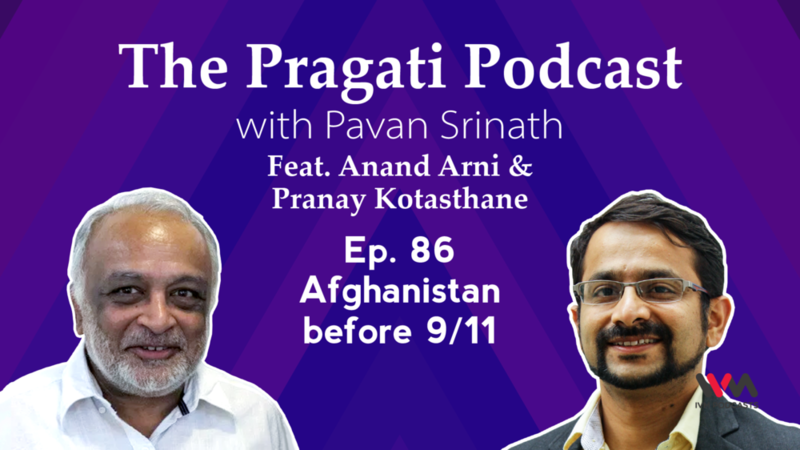 Anand Arni and Pranay Kotasthane join host Pavan Srinath on Episode 86 of the Pragati Podcast to talk about Afghanistan before 9/11. Mr Arni is a Distinguished Fellow and Advisor at the Takshashila Institution, and retired as Special Secretary in the Cabinet Secretariat, Government of India. He served for over 37 years in the Research and Analysis Wing (R&AW), India’s external intelligence agency. He was a part of the hostage rescue team during the Flight IC814 hijacking crisis. Pranay is Fellow and Head of the Geostrategy Programme at the Takshashila Institution. Does India have a strategic culture? Does India display strategic thought and action on global affairs? There is wide-spread skepticism about India having any grand strategy, but are people mistaking form for substance? Dhruva Jaishankar argues that India indeed has a vibrant strategic culture on Episode 85 of The Pragati Podcast. 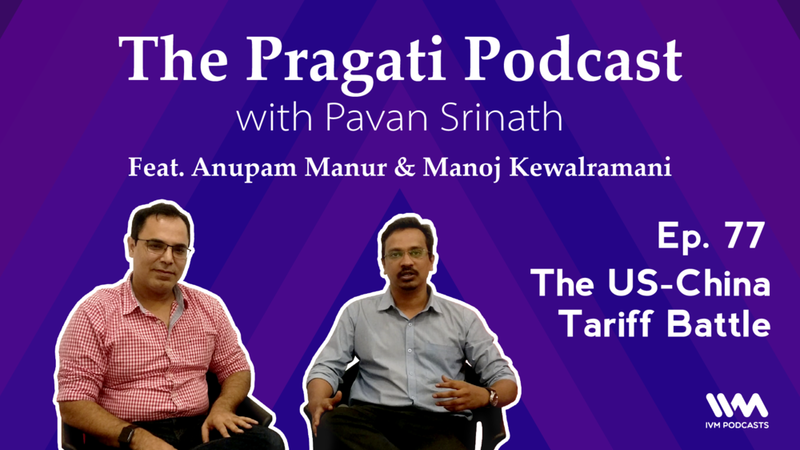 The Pragati Podcast is a weekly talkshow on public policy, economics and international affairs, hosted by Pavan Srinath. Dhruva Jaishankar is Fellow in Foreign Policy Studies at Brookings India in New Delhi and the Brookings Institution in Washington DC. He is also a Non-Resident Fellow with the Lowy Institute in Australia. His research examines India’s role in the international system and the effects of global developments on India’s politics, economics, and society, with a particular focus on India’s relations with the United States, the Indo-Pacific, and Europe. Dhruva and Pavan talk about why many believe that India lacks a strategic culture, explore India's national security apparatus, examine India's grand strategy since achieving independence, and what major strategic challenges the Republic needs to face in the coming years and decades. How can great academic research lead to building a great tech company? Listen to Vijay Chandru talk about his life, work and journey as one of India's first academic entrepreneurs on Episode 84 of The Pragati Podcast. The Pragati Podcast is a weekly talkshow on public policy, economics and international relations hosted by Pavan Srinath. Shambhavi Naik, Fellow at the Takshashila Institution, joins this episode as a co-host. Vijay Chandru is the Co-founder and Director of Strand Life Sciences, one of India's top biotech companies, which focuses on next-generation precision medicine and diagnostics. Before becoming an entrepreneur, he was an academic researcher and professor of Computational Mathematics at Purdue University and the Indian Institute of Science. He is also currently a Distinguished Technologist and Adjunct Faculty at IISc. Dr. Chandru has a wide range of expertise and experience ranging from artificial intelligence to computational biology to precision medicine. On this episode, he shares how good academics make for natural entrepreneurs, and how different paths can be taken by them. He also shares his own journey, where he and his colleagues took a leap from academia into the tech startup world at a time when few others were taking the plunge. The episode also includes discussions on how computational biology and gene sequencing technology has evolved, and how modern medicine is getting shaped by new research and new solutions. Podcasts are all about voices and conversations, but how did India's own voice-over industry evolve? On Episode 83 of Pragati Podcast, Shammi Narang and Dishant Narang share their personal journey from the early days of radio ads in India to the rapidly growing industry that is voice-acting today. Shammi and Dishant Narang run Pindrop Media in New Delhi, and Shammi Narang is the Hindi voice of all Metro rail services in India today. Starting his voice career with Voice of America Hindi in the 1970s, he is a celebrated Doordarshan anchor from the 1980s, and has been a leader in the voice-over industry in India since then. Why is China investing in belts and roads, building infrastructure from the Balkans to Sri Lanka? Why is India building roads in Afghanistan or wants to build train lines connecting India's Northeastern states with Myanmar and Thailand? Is this all because of grand geopolitical considerations, or is it mainly just economics that drives these ideas? Ambassador Shivshankar Menon talks to guest host Pranay Kotasthane about connectivity on Episode 82 of The Pragati Podcast. Sixty nine years ago, Indians established a radical new government that put the individual at the centre of all governance. Republic Day celebrates the Constitution of India, where we not only sought freedom from the British, but freedom from the evils that plagued our society. 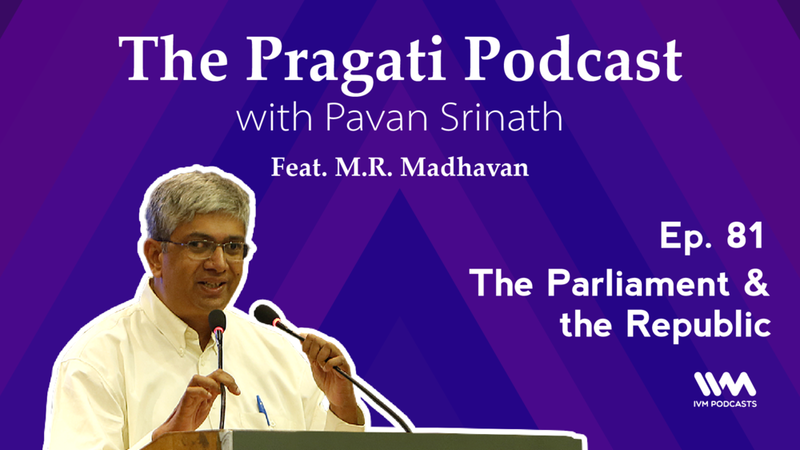 MR Madhavan talks to Pavan Srinath on The Pragati Podcast on the Indian Republic and the Indian Parliament. How many countries have even managed to hang on to their constitution for almost 70 years? How can the Parliament be reformed such that voters can hold their MPs more accountable? Do political parties even have any real constitutional status and recognition? What legal innovations did we need to keep the Republic alive? How has the anti-defection law crippled the Indian legislature? Can coalition governments actually lead to more consultative law-making? How can the office of the Lok Sabha Speaker be made more independent? MR Madhavan is the President and Co-Founder of PRS Legislative Research, one of India's most unique and impactful thinktanks. PRS tracks the functioning of the Indian Parliament and works with MPs across political parties and MLAs from various states. PRS provides research support to legislators via analysis of legislative issues, by providing fellowships to research assistants and more. How do you report on India's complex neighbourhood as a journalist in Delhi? 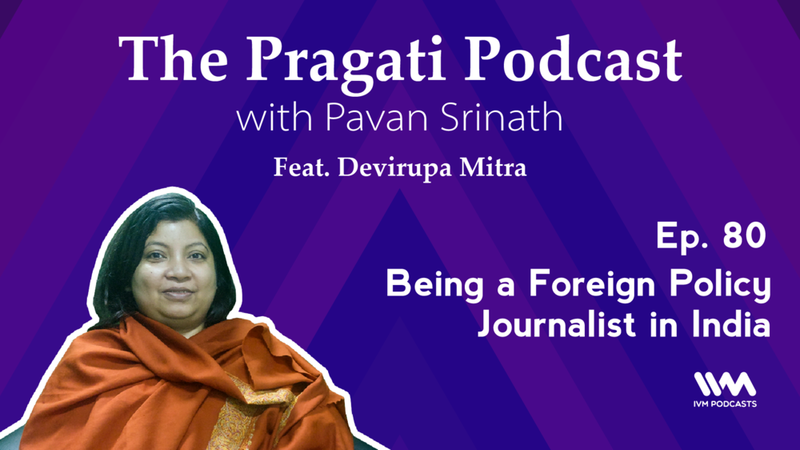 Devirupa Mitra of The Wire talks to host Pavan Srinath on Episode 80 of The Pragati Podcast about being on the foreign policy beat. Devirupa Mitra is Deputy Editor & Diplomatic Correspondent at The Wire, with over 15 years of journalistic experience. She specialises in reporting on domestic developments in India's neighbours, and about India's relations with them. She has been on the Ministry of External Affairs 'beat' for over seven years. This is the third conversation on the Pragati Podcast on the practice of journalism in India. In Episode 65, host Pavan Srinath spoke to Dhanya Rajendran of The News Minute, on building an online news portal, and about reporting during the time of natural disasters. In Episode 68, Pavan spoke to James Crabtree about being a Foreign correspondent in Mumbai for the Financial Times. Do also listen to The Seen and the Unseen with Amit Varma on the state of the media: One & Two. Ep. 79: Corporate-Government Relations in India. How should we think of the relationship between governments and businesses? Can the private sector engage with governments in a way that doesn't involve corruption, cronyism and more? Is 'Lobbying' a bad word? Rahul Sharma speaks to host Pavan Srinath on Episode 79 of The Pragati Podcast on how corporate-government relations are evolving in India. Rahul Sharma is one of India's top public affairs professionals, and Managing Director at APCO Worldwide. He was previously the Deputy Secretary General at FICCI, the Federation of Indian Chambers of Commerce and Industry. He is a Founding Member and former President of PAFI, the Public Affairs Forum of India. He also teaches strategic media engagement at the Takshashila Institution's Post-Graduate Programme in Public Policy. The US-China Trade War goes well beyond tariffs on steel. Tariffs might just be a current battle, but the real conflict between China and the United States could be on technology dominance. In Episode 78, Anupam Manur and Manoj Kewalramani talk to host Pavan Srinath about how the first moves have been made now in a US-China War for Technology. To use a Chinese phrase, this might be China's new Long March towards technological dominance. Episode 77 & 78 are a two-episode special on The Pragati Podcast that demystifies the ongoing economic conflict between the USA and China. A Trade War between the United States and China has dominated headlines and discussions across the world in 2018. Is this really a war? Is it a battle? Do all such metaphors distort discussions on trade? In Episode 77, Anupam Manur and Manoj Kewalramani talk to host Pavan Srinath about how this is really a US-China battle of tariffs and not a trade war. Episode 77 & 78 are a two-episode special on The Pragati Podcast that demystifies ongoing economic conflict between the USA and China. 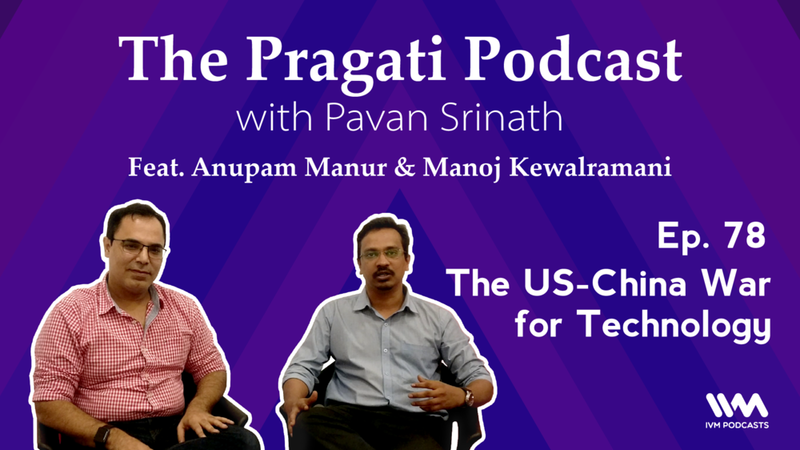 Don't miss Episode 78 of the Pragati Podcast, where Anupam and Manoj continue the conversation and talk about how a US-China War for Technology may be starting right now. How should we think about India as a republic and as a democracy? What has India succeeded in doing, and where do we still have a long way to go? 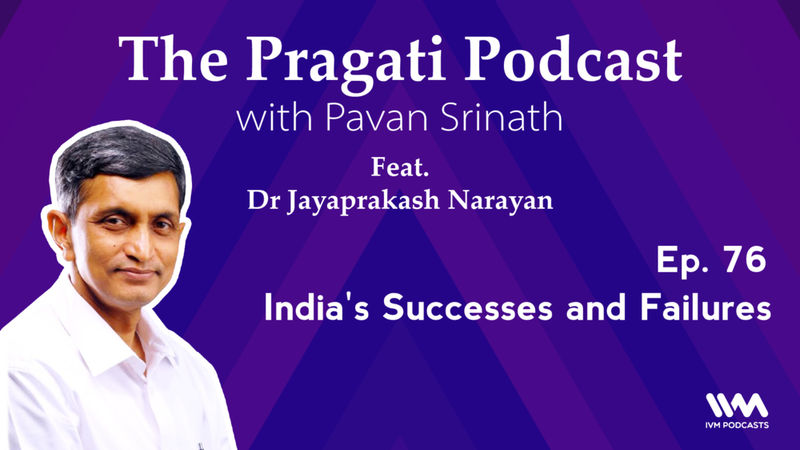 Dr Jayaprakash Narayan, known to all as Dr JP, shares his realism and his optimism with host Pavan Srinath in the first Pragati Podcast episode of 2019. Dr JP has been at the forefront of reform and change in India, as an outstanding IAS officer, as the founder of the Lok Satta Party, as an MLA in Andhra Pradesh, as a member of the Second Administrative Reforms Commission, as the founder of the Foundation for Democratic Reforms, and as a lot more. His contributions are visible in numerous legislations and a few constitutional amendments, along with decades of public debates and action. If you have any questions or comments, write in to podcast@thinkpragati.com. How is India doing on increasing access to finance for all its citizens? When we talk about microfinance, are we actually talking about only loans? Malavika Raghavan has a wide-ranging conversation on financial inclusion with host Pavan Srinath and guest co-host Manasa Venkataraman on Episode 75 of the Pragati Podcast. Malavika is a lawyer by training and heads the Future of Finance initiative at Dvara Research. She is also a 2018 Chevening Financial Services Fellow, and has written and researched extensively on policy and regulation at the intersection of technology, finance, and inclusion. Kannada barutta? Check out the Thale-Harate Kannada Podcast, co-hosted by Pavan Srinath. This week on Episode 3, they talk about hacking and cybersecurity with guest Sandesh Anand. ಬನ್ನಿ ಹರಟೆ ಹೊಡಿಯೋಣ! Ep. 74: Why Should Indians Care About Distant ISIS? The Islamic State in Iraq and Syria, ISIS, is rapidly losing territory and seems to be collapsing. Can this collapsing Islamic State pose new challenges to India and its neighbourhood? Foreign policy scholar Kabir Taneja talks to host Pavan Srinath on ISIS and terrorism in the age of social media on Episode 74 of the Pragati Podcast. He makes a persuasive case for more attention and scholarship on ISIS. Kabir Taneja is an Associate Fellow at the Observer Research Foundation and works on India's relations with West Asia. He recently published a monograph on The ISIS Phenomenon: South Asia and Beyond. This week, host Pavan Srinath has also launched the Thale-Harate Kannada Podcast with Surya Prakash BS and Ganesh Chakravarthi on the IVM Podcast Network. Kannada barutta? Then check out this new weekly podcast that bridges the worlds of Kannada and English, and Karnataka and the world. ಬನ್ನಿ ಹರಟೆ ಹೊಡಿಯೋಣ! You can follow the Thale-Harate Kannada Podcast at @Haratepod on Facebook, Twitter & Instagram.